Wright Heating, Cooling, & Electrical repairs and services ALL makes and models of air conditioning equipment. We also offer great maintenance plans to make sure you stay comfortable in your home year-round. 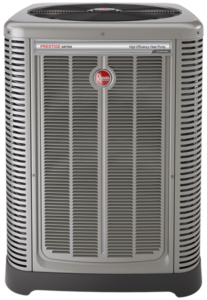 We are a Rheem dealer which means we offer new installations the following types of air conditioners. PlusOne™ Expanded Valve Space – 3″-4″-5″ service valve space – provides a minimum working area of 27-square inches for easier access. PlusOne™ Triple Service Access – 15″ wide, industry leading corner service access – makes repairs easier and faster. Powder coat paint system – for a long lasting professional finish. The Copeland Scroll™ Variable Speed Compressor. Scroll compressor – uses 70% fewer moving parts for higher efficiency and increased reliability. Modern cabinet aesthetics – increased curb appeal with visually appealing design.